Growing government initiatives, declining module prices, rising awareness, fleet management and need to remain connected are some of the few factors that have resulted in the overall growth of M2M market in India. Government initiatives to promote M2M industry in National Telecom Policy and Smart City project is further expected to boost the growth of the market. According to 6Wresearch, India M2M market is estimated to generate $7.10 billion by 2021. In India's M2M market, M2M service segment accounted for majority of the market revenue generated from verticals such as automobile & transportation, utilities, retail & financial services, healthcare, and agriculture. However, during 2015-21, share of M2M connectivity segment would increase owing to growing opportunities of telecom companies in M2M space. Amongst all verticals, automobile, transportation and logistics vertical has led the market and is expected to maintain its marker dominance through the forecast period. The report thoroughly covers the market by M2M ecosystem by hardware, connectivity, services, applications, and regions. The report provides unbiased and detailed analysis of the on-going trends, opportunities, high growth areas, and market drivers, which would help stakeholders to device and align market strategies according to the current and future market dynamics. 13.12	Cisco Systems (India) Pvt Ltd. In the country, the market is primarily driven by M2M services segment followed by the M2M connectivity and M2M hardware. The M2M service market is expected to register to grow further in the forecast period due to the increasing awareness, favourable regulatory impositions and rising government initiatives in the country. Amongst all the applications, automobile, transportation and logistics has generated largest revenue share of the market pie in the country and would maintain its market leadership through the forecast period as well. 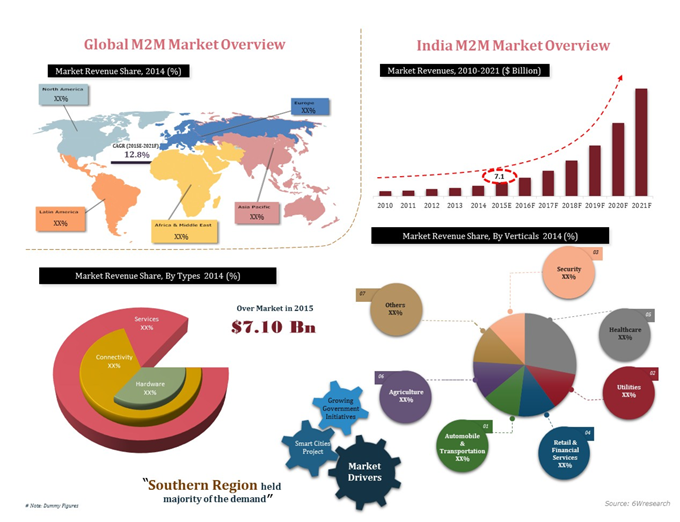 “India M2M Market (2015–2021)” report estimates and forecast overall India M2M market by revenue, by type such as M2M hardware, M2m connectivity and M2M services, applications and regions such as northern region, eastern region, western region, southern region and central region. The report also gives the insights on market trends, company profiles, market drivers and restraints.